As I make the transition to focusing my research on mountaineering, there are two questions that I ask myself: first, "what do I already know about mountaineering?" and second, "what do I want to know about mountaineering?". My answers to these questions can be found below! 1. "What do I already know about mountaineering? Takes place in the mountains. Various terrains such as rock, snow, and ice. Both men and women participate. Has been done for many years. Very important to learn technical skills prior to climbing. 2. "What do I want to know about mountaineering?" When, where, why did it begin? Who were the first mountaineers? When, why, how did women get involved? What have been the greatest accomplishments and failures? What gear is required for various terrains? Is there any standard gear? How has gear changed over the years? 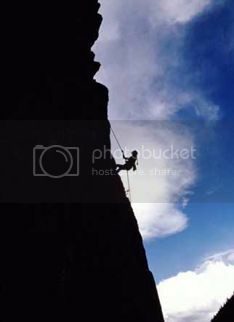 Are there different branches/types of mountaineering? What are most popular places to climb today? What is the most dangerous climbs? How/why do people become involved? Who are the big names in mountaineering today? Is there a "typical" mountaineer? Over the next few weeks, I will be researching mountaineering through various texts and films. As I learn new information, I will answer the "what do I want to know?" questions on my Research page.